This entry was posted in IT and tagged notizie on September 19, 2015 by FEMEN. Femministe Prêt-à-porter – Quando il femminismo va di moda. This entry was posted in IT and tagged notizie on September 17, 2015 by FEMEN. 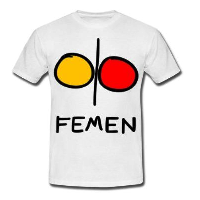 This entry was posted in IT and tagged notizie on September 16, 2015 by FEMEN. This entry was posted in IT and tagged notizie on September 15, 2015 by FEMEN. interrotto uno dei dibattiti irrompendo sul palco a seno nudo.